A handwritten projection. 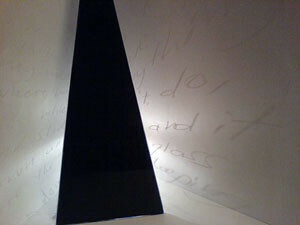 An acrylic prototype (height 115cm) of what should be a pyramid made of a single sheet clear float glass which has partly been layered with opaque black. Writing engraved in clear glass on the sides of the pyramid, remains near invisible, until the light is switched on. 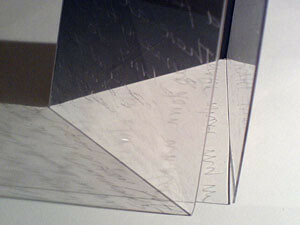 The text is projected onto the walls, appearing to protrude from the corner in which the pyramid is standing.